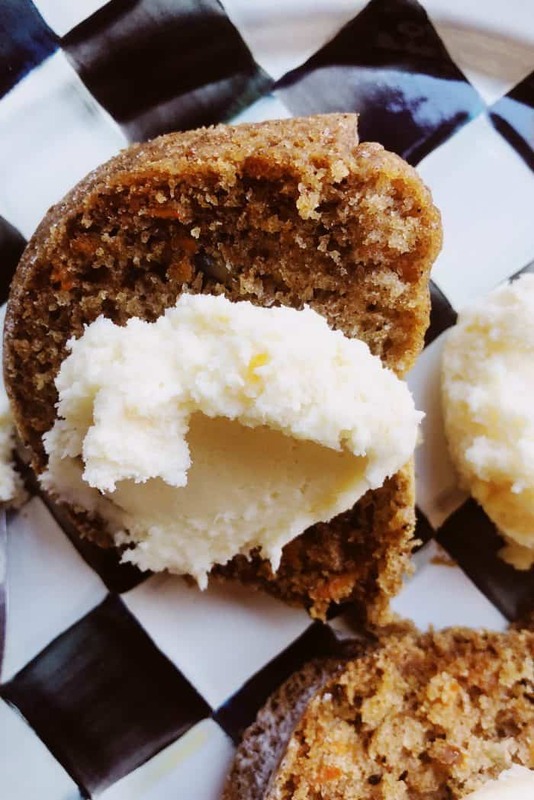 Enjoy moist, delicious Carrot Cake with Cream Cheese Frosting, a classic cake recipe served with an ultra-creamy frosting on the side. For easy making, use already shredded carrots for this Best Carrot Cake recipe. Optional to add big chunks of chopped walnuts. 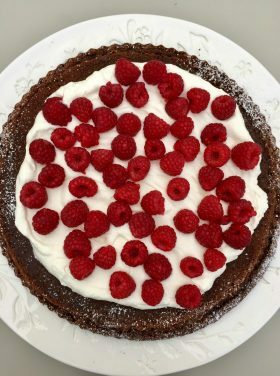 One of the most popular cakes, this recipe serves 8-12. Friends, over the weekend we enjoyed a lovely family dinner with our daughter home from college. Everyone together is such a special gift for me as a mom. In fact, just being together is the perfect gift for me. Smack dab in the center of the table was Betty’s Celebratory Carrot Cake, with a side of cream cheese frosting. 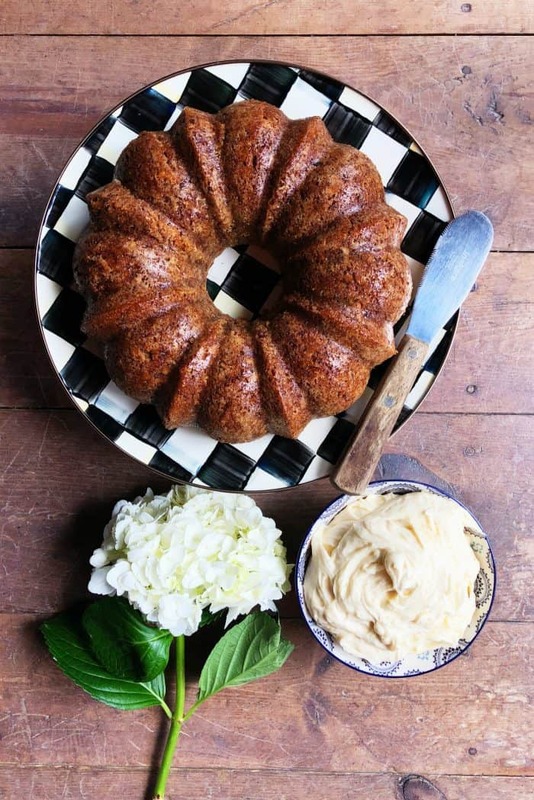 Maybe you’ve tried my family’s Banana Walnut Cake with Cream Cheese Frosting (so pretty, garnished with real flowers), but if not, this cake today is a MUST make recipe! 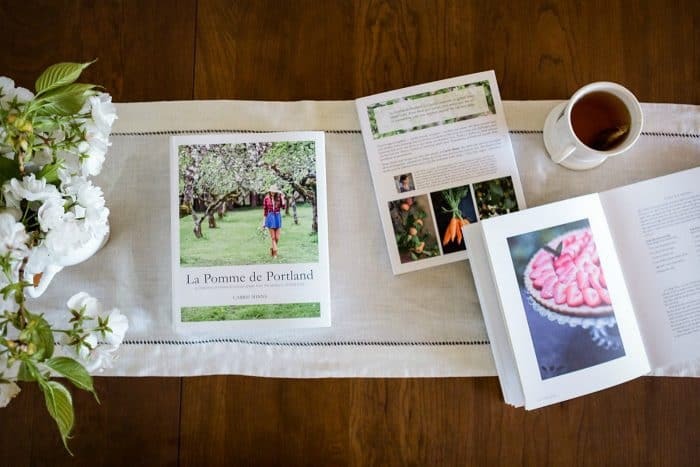 My friend Carrie Minns just published her first beautiful cookbook, La Pomme de Portland (A collection of stories and recipes drawn from the seasons of food & life). 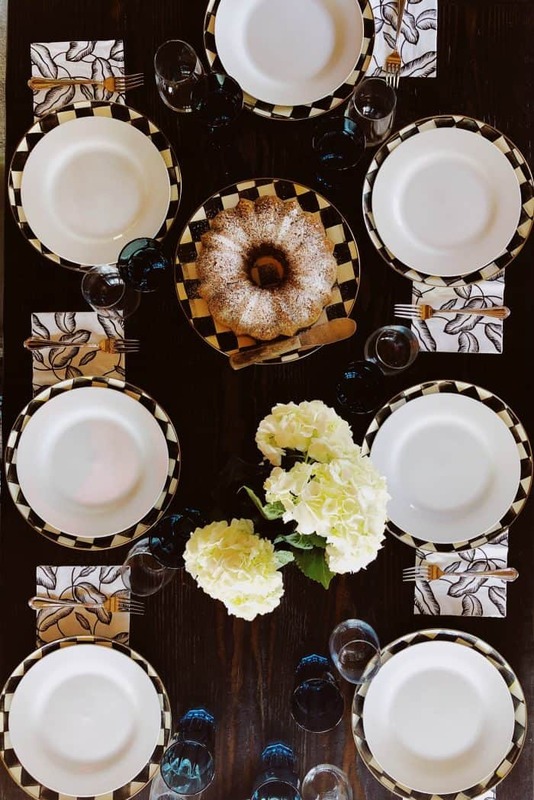 It’s not only filled with classic recipes, everything from appetizers to desserts, but it also includes thoughts on why we gather our loved ones together. 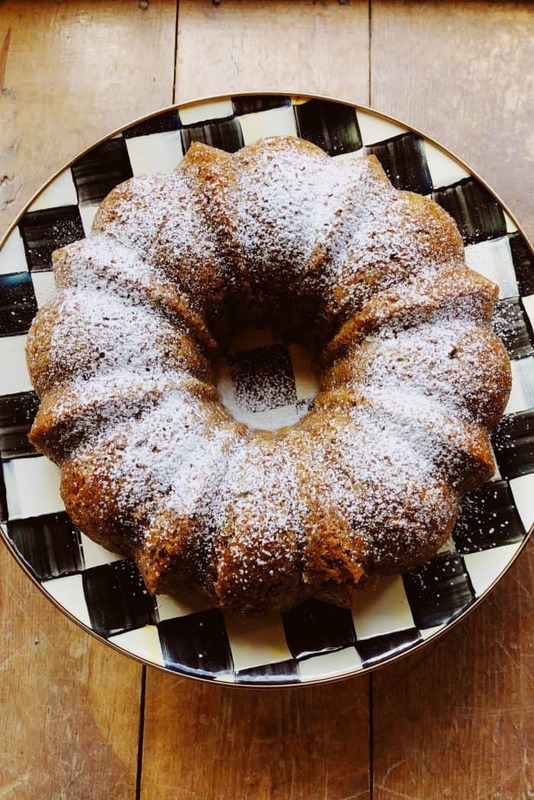 Like this carrot cake, so moist and …. perfect. 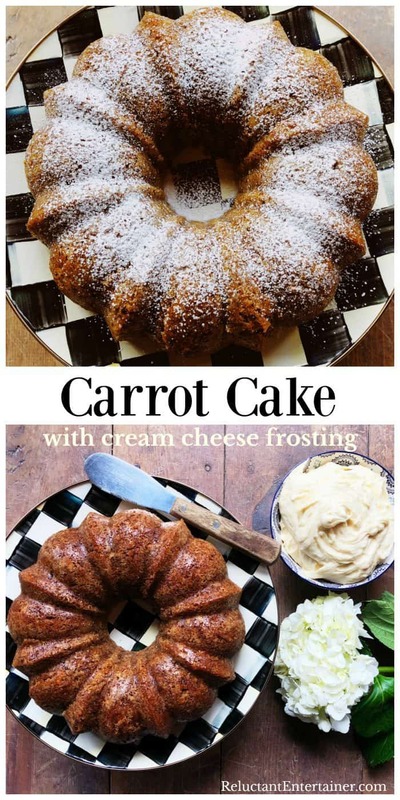 Yes, carrot cake is perfection. But guess what, friends? 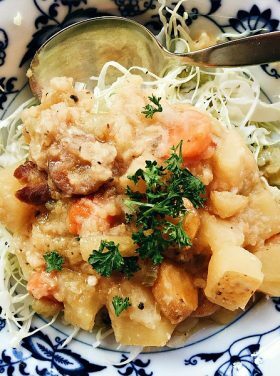 When I made this recipe last week, I got onto my iPhone and talked to Seri … Seri, set timer to 45 minutes. But I never followed up to see if Seri heard me, and she didn’t get it right. So, inevitably I baked this cake a little longer than I should have the first time. Like 20 minutes longer, when I realized something was not right (the aroma totally gave it away … the cake is done, the cake is done!). That’s right. No timer, overcooked, but we ate it anyway, and it was so good. I did later bake the Carrot Cake again, this time to a moist perfection. Carrie recommends serving this cake deconstructed, with the cream cheese frosting on the side. Like butter. Slice, spread the frosting on the plate next to the cake. Like butter. Take your fork and dig in. 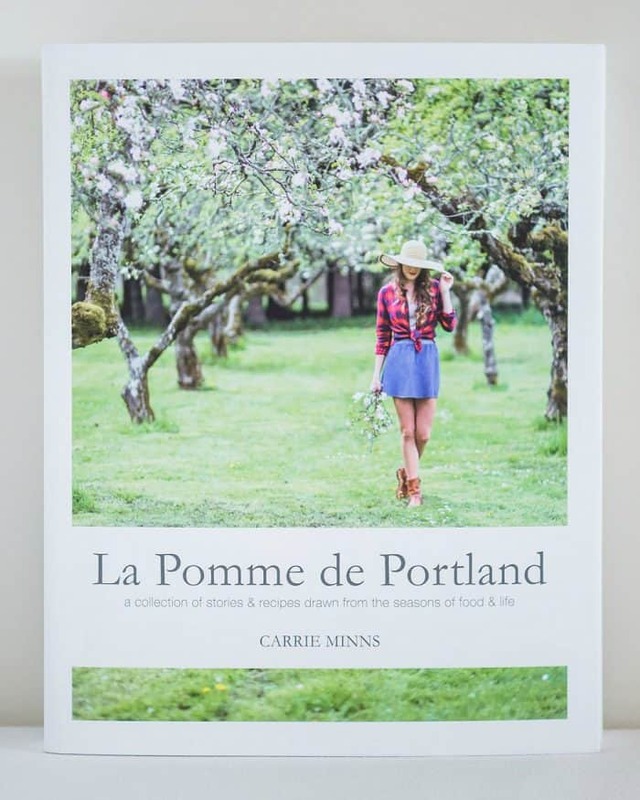 Carrie’s stories and recipes in La Pomme de Portland are are from the seasons of life, when she sent her youngest off to kindergarten, ushered her eldest out of the nest, and lost her mom to ALS. I love her gentle way of connecting these life’s moments to food. Carrie and I have traveled around the US to many food conferences since 2010. We couldn’t even recall the cities we’ve visited, as roommates, but we both remember walking together through momentous seasons in our lives. My favorite? Cozy and simple. Meeting up for coffee over here in Sunriver, and talking about this book! I’m happy to see it come to fruition, and celebrate with my friend. I hope you’ll jump over and buy yourself a copy. I’ve purchased several already for gifts, and the recipients have loved the recipes and Carrie’s beautiful writing. In a medium bowl, stir together your flour, cinnamon, nutmeg, baking soda, baking powder, and salt; set aside. In a large mixing bowl, beat the oil, sugar, eggs, and vanilla for about a minute. Pour in the flour mixture and mix on low until just combined. Add in the carrots and nuts (optional). 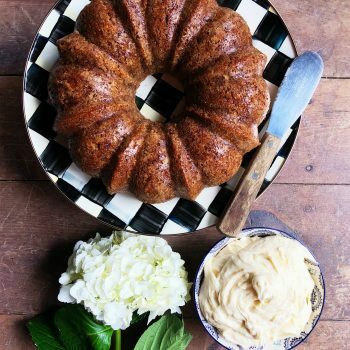 Pour batter into your prepared Bundt pan and bake for 45-60 minutes or until a toothpick inserted in the middle comes out clean. Place on a cooling rack and let cool completely before removing from pan. 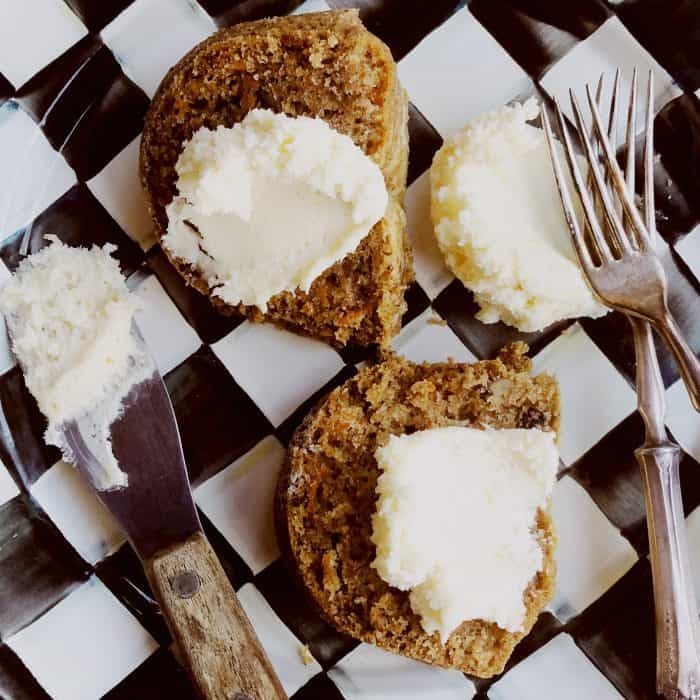 While cake is baking, whip together the frosting ingredients—butter, cream cheese, confectioner’s sugar, vanilla, and orange zest—until smooth and creamy. Refrigerate frosting when not using. Once cake is cooled and removed from pan, dust lightly with confectioner’s sugar. 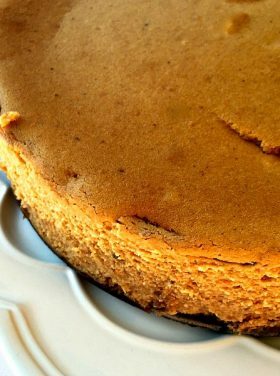 Slice and serve with cream cheese frosting on the side. Enjoy! More cakes with cream cheese frosting: Bake a Cake: Root Beer Float Cake [RE], Whole Grain Pumpkin Scone [RE], Cherry Almond Bundt Cake [Beyond Frosting], and Strawberry Shortcake Cake Roll [Crazy for Crust]. I just placed an order for La Pomme de Portland! I love cookbooks and I trust your recommendation Sandy!